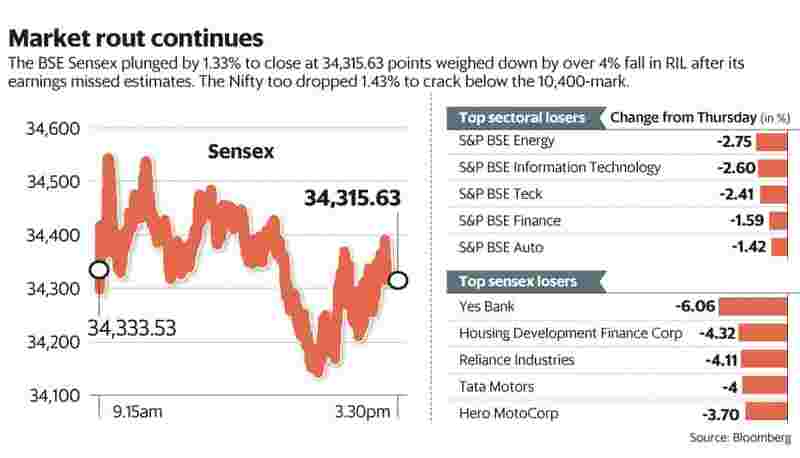 Benchmark equity index Sensex eroded more than 450 points on Friday, weighed down by a more than 4% fall in Reliance Industries Ltd (RIL) after its earnings missed estimates. The free fall in non-banking financial companies (NBFCs) continued, meanwhile, despite the Reserve Bank of India (RBI) announcing more measures to increase credit flow to such companies. The near term market outlook will be dictated by earnings, while global cues will also be closely watched. The BSE 30-share Sensex closed 1.33% or 463.95 points down at 34,315.63 points, while the National Stock Exchange’s (NSE) 50-share Nifty dropped 1.43% or 149.50 points to close at 10,303.55 points. Earlier in the day, the Sensex fell as much as 1.84% or 639.26 points to 34,140.32, while the Nifty dropped 1.95% or 203.45 points to 10,249.60. Oil-to-telecom conglomerate RIL contributed the most to Sensex’s losses, falling 4.11% as it failed to meet Street expectations for September quarter earnings and as it announced a further delay in commissioning of the petcoke gasification project. NBFCs continued their slide. “For NBFCs, there is still quite a bit of nervousness, though the government and RBI have come out with various steps to ease liquidity," said Harsha Upadhyaya, chief investment officer (CIO), equity, at Kotak Mahindra Asset Management Co.
“Valuations were on the higher side, and they are seeing a correction," said Upadhyaya. The RBI on Friday incentivized bank lending to NBFCs by easing liquidity norms and increasing the ceiling for lending to a single NBFC. Among NBFCs, Indiabulls Housing Finance Ltd tumbled 17.06%, while Dewan Housing Finance Corporation Ltd slipped 10.37%. Edelweiss Financial Services Ltd dropped 8.92%, while PNB Housing Finance Ltd and Repco Home Finance Ltd fell 18.55% and 9.2% respectively. “I think there is profit booking in the IT space after the recent sharp rally," said Updahyaya. Software services exporter Infosys Ltd fell 3.11% and larger rival Tata Consultancy Services Ltd dropped 0.55%. These two stocks are still up 31.36% and 41.98% respectively for the year to date, while the Sensex has gained a mere 0.76% in the same period. Nearly two shares fell for every stock that advanced on the BSE. Among sectoral indices, only the BSE FMCG index managed to close higher. The BSE Energy index and BSE IT index fell the most, dropping 2.75% and 2.60% respectively. Foreign institutional investors (FIIs) have already sold a net of around $2.5 billion of Indian shares in October and, if the sell-off continues, this could be their largest outflow from Indian equities in 2018. Domestic institutional investors (DIIs) on the other hand have infused a net of ₹ 16,512.56 crore in the asset class so far this month. If the trend continues, it could be the biggest net inflow since February. “Markets could remain volatile as the macro issues are still bothering. There is no resolution to higher crude prices and higher current account deficit (CAD)," said Upadhyaya. “We also have state elections and general elections round the corner, and hence, volatility will persist." That seemed to be the consensus view. “The recent slide indicates pessimism among the participants, which triggers selling pressure on every rise. And we feel it’ll take time to subside," said Jayant Manglik, president, Religare Broking Ltd.
“We advise keeping a close watch on earnings, currency movement and global markets for further cues," Manglik said, adding that the support is intact at 10,100 for Nifty.